My season ticket for the proscenium theater at the Guthrie (the rectangular, red one) is in the front row. Those are the cheap seats, under the theory that they're "too close." But in my book, there is no "too close" at the theater. I like to be close enough to be in danger of being spat upon (which was a definite danger at this performance!). I like to be able to see the expressions on the actors' faces, and I feel more immersed in the world the closer I am, with no distractions between me and the stage. Depending on the show and the set design, sometimes there's a row or two added in front of me, but not at this show. The stage for Arms and the Man includes a rounded wooden projection that came out practically into my lap! The stage ended about three feet in front of me at nose level. All along the edge of the stage is a row of toy soldiers and old books, so I had to watch the play through the soldiers. It was a little distracting when the action of the play was at the back of the stage, but I soon got used to it. Well worth it to be that close to the charming small town Bulgarian estate that was the setting for this play. 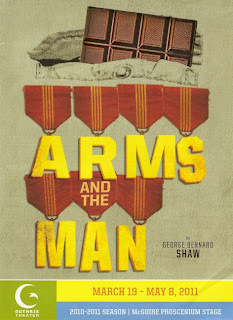 George Bernard Shaw's play Arms and the Man is set during the Serbo-Bulgarian war of 1885. The first of three acts takes place in the bedchamber of the daughter of a prominent Bulgarian family, while her father is off fighting in the war. Raina's peaceful evening is interrupted when the Serbian soldiers are chased through the town and one of the men, a professional soldier from Switzerland, climbs through the window of her room to escape. He's weary from battle, and Raina decides to hide him (out of pity or boredom, it's hard to know). The soldier is played by one of my favorite local actors (and one of my costars from the Coen brothers film A Serious Man), Jim Lichtsheidl. Jim is brilliant at playing multiple characters, as he did in last fall's 39 Steps, and Tiny Kushner (part of Kushnerfest 2009), just to name a few. He has this great physicality about him that allows him to completely transform into another character. This time his only role is that of Captain Bluntschli, and it turns out he's just as wonderful when he's only one person. The weary captain wants nothing more than food and rest, having eaten all of the chocolate he carries instead of ammunition. 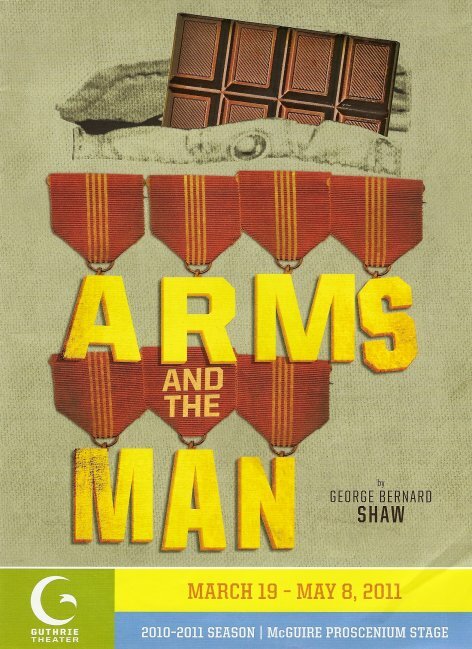 Raina offers him chocolate creams, which he devours, and thereafter refers to him as "my chocolate cream soldier." She convinces her mother to let him stay, but since he's fallen into a deep sleep on her bed, they couldn't move him anyway! After a brief intermission (during which the audience is entertained by music and dancing by J.C. Cutler's Nicola, the family servant), Act II takes place a few months later in the garden outside the house. Father has returned from the war, as has Raina's betrothed, the brave and buffoonish Sergius. They tell Raina and her mother about a scandalous story of Swiss soldier who was taken in by two women, not realizing that they were talking to those very women! When Captain Bluntschli arrives to return the coat he borrowed, Raina's mother tries to shoo him off, but not before Father has seen him and asked him to stay for lunch. In Act III the characters move inside into the library, where it is eventually revealed that Raina and her mother are the ones who hid Captain Bluntschli, and romantic entanglements become untangled. The strong cast also features the amazing Peter Michael Goetz, veteran of over 80 productions at the Guthrie in addition to his numerous movie and TV roles. He plays the father/major as a somewhat befuddled man who's not quite sure what's going on in his own house. Kate Eifrig is the stern and in control woman of the house, trying to hide a secret and ensure a good marriage for her daughter. Michael Schantz (a Guthrie newcomer) is terrifically over-the-top as the "hero" Sergius who's obsessed with the proper appearance of things, even while cheating on his fiance with her maid. Raina (the delightful and spirited Mariko Nakasone) is right there with him, playing the game, until she realizes that Captain Bluntschli is the one person who sees her as she really is, and therefore she has no need to act the part in from of him. The set is wonderful and whimsical. In addition to the toy soldiers mentioned earlier, the snowy mountaintops of Bulgaria surround the main set, of which there are three: Raina's bedchamber with its stately balcony doors through which the soldier arrives, the garden with big purple flowers and a free-hanging second story representing the house, and the library with its tall shelves and animal heads hanging on the walls. Everything is oversized and utterly charming. The costumes are to die for. Raina and her mother wear beautiful gowns (and since I was on shoe level I got a great look at Raina's pretty little low-heeled satin slippers that match her dresses) and the men wear elaborate uniforms, everything trimmed in fur. Raina has a huge gorgeous fur cloak that I coveted (but of course in faux fur only!). From the baked mac and cheese at the Level Five Cafe before the show, to Captain Bluntschli's final kiss of Raina's hand, it was a thoroughly enjoyable evening at the Guthrie. A funny and smart play, wonderful acting, gorgeous set and costumes, what more does one need?